Private equity rolls on: How investors and managers are responding to scale | Muirbury & Co. The industry has taken a breather in 2018 as firms and their clients adapt to a new, more competitive normal. 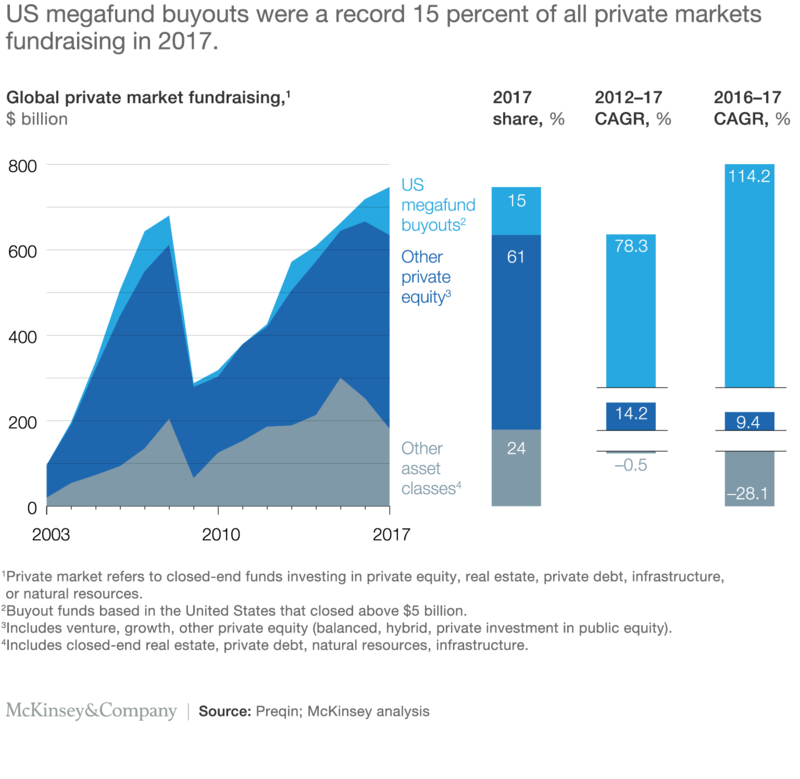 In this episode of the McKinsey Podcast, recorded in June 2018, McKinsey partners Bryce Klempner and Matt Portner speak with McKinsey Publishing’s Cait Murphy about fundraising in private markets in 2017 and what is ahead for investors and asset managers. Simon London: Hello, and welcome to this edition of the McKinsey Podcast with me, Simon London. Today, we’re going to be taking the pulse of private markets—that is, the world of private equity and private debt. 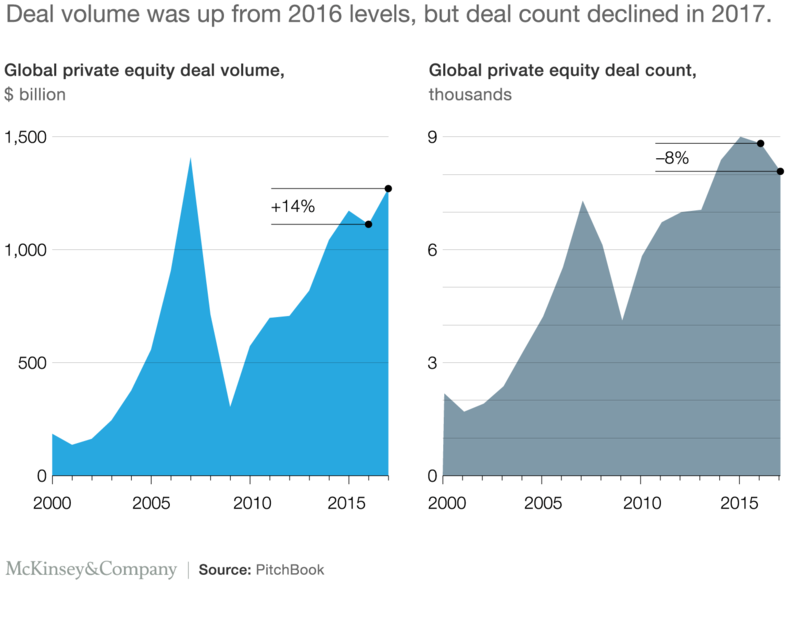 For the last few years, private equity companies, or general partners as they’re known in the trade, have been riding on a wave of enthusiasm. As big investors, the so-called limited partners have allocated an increasing percentage of their portfolios to private assets. Scratch the surface, and the picture is a little more complex. The flow of money into private markets has slowed somewhat in 2018. Deal activity has also slowed, a sign that general partners are having more difficulty finding companies to buy at prices that make financial sense. The big limited partners, meanwhile, are starting to push for special treatment in the form of joint ventures or separately managed accounts as opposed to investing alongside their peers in so-called comingled funds. Our guides today into the world of private markets are McKinsey partners Bryce Klempner and Matt Portner. Asking the questions is my McKinsey Publishing colleague Cait Murphy. With the scene set, it’s over to Cait. Cait Murphy: Matt, let’s start by talking about capital flows in the PE [private equity] industry. What are the most important trends in terms of how much money is being raised and where? Matt Portner: Last year was a record year for fundraising in private markets overall. What’s interesting is where that growth came from specifically. So, $750 billion globally was raised in private markets. The interesting trends are PE and private debt saw very healthy growth—11 percent and 10 percent, respectively. What’s most interesting is where that growth came from in PE. It was driven heavily by what we call megafunds, which would be those over $5 billion. Bryce Klempner: It’s worth noting that all the growth in 2017 came from a subsegment of a subsegment. If you look at US-based PE megafirms raising buyout funds, their growth accounted for all of the growth in overall private markets fundraising and then some [Exhibit 1]. Absent those, the market was slightly down. As you look at 2018, the number of funds raised thus far is down about 40 percent, while aggregate capital raised within PE is down about 30 percent so far. Only time will tell how this plays out over the remainder of the year, but you do see a leveling off of the heady growth that characterized 2017. The industry has had quite an exciting run. The amount of capital that has been coming in has broken records. Maybe some limited partners allocating capital to the asset class have eased off the gas just a little, but we don’t see that as particularly problematic. If you look at the operating metrics for the industry overall, such as the amount of dry powder relative to the amount of deals getting done, it’s been stable over time. Cait Murphy: Let’s talk about investors for a moment, since you raised the topic. What are major investors doing in terms of investing capital in PE? Matt Portner: You’re seeing increased interest across the board, but there are some slight nuances by type of investor. The endowments have been fans of the private markets for quite a long time. Pension funds are increasing their allocations to the asset class consistently. And I think sovereign wealth funds are the big new players, not only in terms of amount of capital they’re allocating, but also in the way they’re playing in the asset class—so, increasingly looking at coinvestment and direct investment as a way to play and not just in comingled funds. Bryce Klempner: It’s also worth noting that family offices and other types of investing institutions that move closer to the retail market have been both putting more capital in the asset class and finding it overall easier to access the asset class, as for a long time general partners have been seeking ways to tap that pool of capital. None of the general partners have quite figured out how to access the retail markets, per se. The products that have started to proliferate there and that are being pushed through the channel of traditional asset-management firms tend to come with fairly high fee burdens. As a result, none of these products has truly blossomed yet, but the move is very clearly in that direction. There is clearly a desire on the part of some of the general partners to figure out ways to democratize access to the asset class, which has historically been the realm only of larger institutions. And it is something that we think will continue to evolve in coming years. Cait Murphy: In 2017, deal volume grew but the actual number of deals completed fell for the second year in a row . Can you please explain what’s going on? Bryce Klempner: At the simplest level, there are two major factors driving that. One is simply that multiples are up. So, the multiple of EBITDA required to buy a company has continued to rise. Since those are up and since there’s a finite amount of money chasing deals, mathematically it’s not surprising that as the price goes up, the volume will go down. Looking at it from a different perspective, you could argue that it’s also about the fact that there is a finite supply of companies out there that can be bought by PE at a given expected return. Matt Portner: To build on Bryce’s point, what’s interesting to note last year is that the average deal size grew from $126 million in 2016 to $157 million in 2017, which is a 25 percent increase. But what’s really interesting about that is that two-thirds of that increase is driven by multiples. It’s not simply a matter of finding companies with higher EBITDA or higher growth. It’s really, really multiples driven. To Bryce’s point, mathematically that’s led to some softening in deal activity. When you dig into that a little bit more, the decrease in deal activity has been across quite a few sectors. The energy sector drove it significantly last year, as you might expect. But even in B2B and B2C deals as well, we saw quite a decrease. And at least for B2C, that’s continued into this year. Bryce Klempner: One other factor here that I would just mention, because often you get the questions of, gosh, there’s been a lot of capital raised—there’s a lot of dry powder out there, is that what’s driving multiples up? Is it because there’s so much more “shadow capital”? Well, yes, in part that’s what it is. But in part, it’s also just the general economy. When PE or PE-style investors go to buy a company, they’re often bidding against other financial investors. But they’re also bidding against “strategics.” And as global stock markets have risen, those strategics are paying with stock that is just worth more. Many of them just have massive cash hoards as well. It’s the combination of these factors that’s pushing multiples up and increasing competition for these deals. Cait Murphy: So, Matt, in a previous interview, you noted that there’s a lot of hand-wringing in the industry about dry powder. Last year, it reached a record of $1.8 trillion, according to McKinsey. Explain the term “dry powder” and what the hand-wringing is about. Matt Portner: Dry powder, in its simplest definition, is capital that has been committed but not called. And so, it is capital on hand that managers have not yet invested. I think the hand-wringing is because in absolute terms, as you noted, that number has increased dramatically over the last few years. What we don’t want to ignore completely is, you can’t just look at it in absolute terms. If you look at it relative to assets under management or fundraising, it’s actually been fairly consistent. And what we’ve talked about is looking at it more as inventory on hand, which is relative to deal activity. And so, dry powder relative to deal activity has been fairly consistent over the last number of years. The one thing to be concerned about is, as we’ve just discussed, deal activity has started to soften in the last couple of years. If that decrease in deal activity continues, and dry powder continues to increase at the rate it is, that could be cause for concern. Bryce Klempner: One note here is that the data is imperfect. A key attribute of private markets is that they are, in fact, private. So, the data that we have is basically data from structures that become public in some way—usually because it’s a blind pool, and a public institution has to report, and hence that comes out into the light. One note on dry powder is that in addition to the $1.7 trillion or $1.8 trillion that’s out there—that, as Matt says, represents a record in absolute terms but in relative terms has been fairly steady—there’s an unknown additional amount of dry powder out there in two different forms of what we call shadow capital. One form is separately managed accounts that general partners have raised but that aren’t being reported publicly in any substantial way because they’re with a single institution at a time. And most of those institutions don’t have public-reporting requirements. The second form of dry powder is capital that limited partners, such as pensions and sovereign wealth funds, have allocated to the PE asset class or to other private market asset classes but which they intend to invest in a form that is not in the kind of comingled vehicle that will become public. So, for instance, when a pension says, “We want to invest some of our capital directly into PE-style transactions or do it as a coinvestment alongside a general partner,” that’s typically not getting picked up in the numbers that are reported on dry powder. To a certain extent, that’s the pointy end of the spear. It’s not most investors that are allocating a lot of their capital this way, but it is increasing. If you look at some of the larger investors that are leaning forward to a greater extent in allocating capital directly or independently into this asset class, half of the capital that they have allocated to PE at this point is, in fact, shadow capital. Cait Murphy: Matt, just going back to what you were saying: on the one hand, you have the record estimate of dry powder, and on the other, a softening of deal numbers. You said, combined, that could be a cause for concern. Can you just expand on that? What’s the worry? Matt Portner: The worry would be that it starts to burn a hole in the external managers’ pockets, and they start doing deals they wouldn’t otherwise want to do, particularly given the valuation environment. So, I think that’s one concern. Our feeling toward that is, yes, it will for some. For the sophisticated managers that continue to rely on their processes and their diligence, it won’t, and they will continue to remain disciplined. But if you see deal activity start to decline, that could be a concern. Bryce Klempner: And on this point, we have seen a greater degree of discipline over the last couple years than we did in the run up to the global financial crisis. Rather than continuing to underwrite or assume increasing multiples, most of the PE managers that we’ve seen are assuming some degree of multiples contraction. They’re assuming that when they sell the company, the multiple that they’re able to receive will be smaller than when they buy the company and that they’re still able to find deals at that level. So, there is greater discipline. Cait Murphy: Bryce, you’ve noted that limited partners are increasingly turning to separately managed accounts, also known as SMAs or strategic partnerships. Why is that the case, and what are the implications? Bryce Klempner: As more capital goes into SMAs, it’s harder for any given observer to understand what’s happening, simply because the data is no longer becoming public. In terms of what it means for the limited partners, the asset owners who are allocating capital, it typically means that they are getting greater discretion, greater transparency, and often paying lower fees in exchange for relationships that are more bespoke. What it means for the general partners is, on the one hand, yes, they’re often receiving lower fees, but it’s often on terms that are preferable for them—longer lockups and access to closer relationships with investors that they’re keen to build long-term partnerships with. Sometimes, as you mentioned, Cait, the most extreme example of the trend toward SMAs is the trend that you mentioned of strategic partnerships, which is still a relatively rare construct that has nevertheless generated quite a bit of interest in the past few years, in particular among large investors who are seeking, in one fell swoop, to find convenient ways of increasing their ability to deploy capital in the private markets in situations where they trust that they won’t do worse than the average. Matt Portner: And for general partners, there are benefits too. Bryce alluded to some of them before. If you eliminate and reduce some of the friction of fundraising consistently for general partners by having a large strategic partnership where capital is recycled back into the partnership, that is hugely beneficial to general partners. And in some instances where they happen to have a strategic partnership with a prominent pension fund or sovereign wealth fund, that provides them what we’d call an anchor tenant in some of their new vehicles. When they’re going out to fund raise for those vehicles, having a very well-respected limited partner already committed can be very helpful for them. Cait Murphy: Can you talk a little bit about how the PE industry is incorporating digital and analytics? In other examples, it’s revolutionizing the processes. There’s one general partner in Europe that has gained a fair bit of attention for meaningfully shifting its sourcing process to be an artificial-intelligence-driven sourcing process where they take 30 or 35 different kinds of what they call “alternative data,” and they smush them together into a giant database. This black box then spits out companies that seem to fit the characteristics of past companies that they’ve had success investing in. Cait Murphy: A lot of what we’ve talked about here is clearly relevant regardless of where you are, whether it be Europe, Asia, or North America. Are there any distinctions between regions in terms of how things are evolving or what the risks are? Bryce Klempner: I’d offer two points of distinction. One is within the developed markets. To paint with a very broad brush, there tends to be a difference in firm personality between the American general partners and the European ones. It’s a difference that I think stems from where these firms came. The American funds tend to be founder driven. They tended to be entrepreneurial start-ups. The European funds, more often, were spinouts of banks. So, they tended to start off with more of an institutional culture, with professional managers. They tended to be less concerned about the notion of succession. They tended to be less centered on one or two people than the American firms. And so, they’ve faced different challenges and opportunities as they scaled. Conversely, the American ones tended to be more entrepreneurial, more centered around one or two or three iconic founders, and that was an opportunity for them in so far as it enabled them historically to make bolder moves to scale faster and so forth. But it also provided some growing pains as that initial generation yielded to their successors. A second dimension is the difference between how this is evolving in the developed markets and in the emerging markets. As important as institutionalization is in the developed markets, it’s even more important in the emerging markets. You’ll often hear limited partners say things along the lines of, “I certainly don’t want to invest in an emerging manager in an emerging market.” If they’re going to allocate capital to developing markets, more often than not they will set a fairly high bar for institutionalization. Matt Portner: To build on that, look at a couple of statistics from Asia, which has been a bit volatile and bumpy over the years in PE. I think one of the signs of the increasing maturation, or the early maturation, of Asian private equity and private markets generally is, deal volume in Asia jumped by 96 percent last year. Granted, these are off smaller bases than we’re talking about in the developed markets. But deal volume jumped significantly, with some huge B2B deals. And fundraising also increased by about 10 percent year on year in Asia. Some specific private markets asset classes, like private debt, have really thrived there recently given the challenges of accessing the debt markets through traditional banks in some Asian countries. So, I think the data is varying out this notion of increasing institutionalization and early maturation. Bryce Klempner: Historically, one way to frame it is that the greatest challenge that limited partners faced in developed-market PE was getting enough capital in. And the greatest challenge they faced in emerging-market private markets was getting any capital out. It was historically quite hard to find firms that had a real track record of successful exits. That’s started to shift. But I think you still see a bit of a bias among limited partners to allocating only to emerging-market managers who’ve really demonstrated an ability to exit as well as deploy capital. Cait Murphy: Thanks very much, Bryce and Matt. Let’s leave it there. I really appreciate you taking the time to speak with us today. And thanks to you, our listeners, for tuning into this episode of the McKinsey Podcast. To find our latest insights and analyses of the PE industry, please go to McKinsey.com. Bryce Klempner is a partner in McKinsey’s Boston office, and Matt Portner is a partner in the Toronto office. Simon London is a member of McKinsey Publishing and is based in the Silicon Valley office, and Cait Murphy is a member of McKinsey Publishing and is based in the New York office.